Bhutanese currency is the ngultrum (nu), which is divided into 100 Cheltrum. The approximate exchange rate is 45.00 nu for one USD. The ngultrum is on par with the Indian Rupee and in Bhutan you can both use the Nu and Indian Rupee. In the larger towns and hotels you can exchange euro’s, US dollars and other world currencies as well as travellers’ cheques from Monday to Friday between 10:00 am and 1:00 pm. In most hotels and stores you can pay with euros and US dollars. In the more rural towns and villages you need to pay with Ngultrum or rupees. In Thimphu some of the smaller bank branches are open Saturday and Sunday for currency exchange. Presently the few Bhutan National Bank ATMs can only be used by local customers. If you plan to make a major purchase, consider bringing US dollars or euro’s in cash. Don’t count on using a credit card in Bhutan. They are accepted at the government-run Handicrafts Emporium, a few other handicraft shops and some of the larger hotels in Thimpu, but these transactions take quiete some time. Also, credit card companies charge high fees and the verification office is only open from 9am to 5pm. This precludes paying your hotel bill at night or when you check out early in the morning. You can cash travellers cheques at any bank, most hotels and the foreign-exchange counter at the airport. Banks charge 1% for cheque encashment. Make sure you only carry well-known brands like American Express, Visa, Thomas Cook, Citibank or Barclays. There is no replacement facility for travellers cheques in Bhutan. 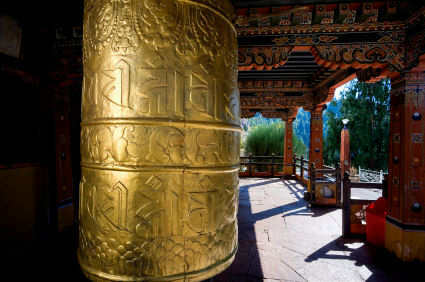 The international dialing code for Bhutan is 00975 (+975). Most of the hotels and guest lodges have international direct dial telephones and faxes. You can make international direct dial to or from Bhutan to anywhere in the world and telephone call booths are found in all major towns. Most of Bhutan has mobile phone coverage. Most cities have internet cafes, buth the connection is slow and it is relatively expensive. In Bhutan people drive on the left side of the road. Banks, shops and government buildings can be closed on these national holidays. Besides these major holidays, there are many other Buddhist holidays which happen every year are at a different day or month. Bhutan has a changeable climate, so bring a layered wardrobe, rain gear and warm clothes for the evening, just like good walking shoes or hiking boots, even if you’re not hiking. Also bring a hat or cap and a good pair of sunglasses. A water bottle, binoculars and polarizing filter for your camera can be very usefull, as well as a day pack or shoulder bag and a telescoping, aluminum or composite walking stock. The Bhutanese deeply respect their king. Keep this in mind when you talk with local people. 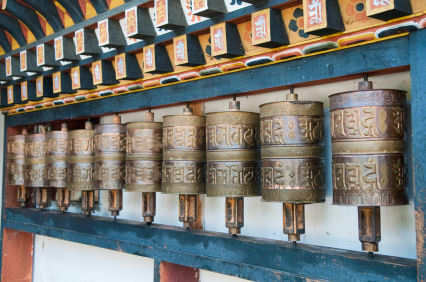 Sacred objects: always pass mani stones, stupas and other religious objects with your right side nearest to the object, and turn prayer wheels in a clockwise direction. Never sit on mani stones or stupas. Clothing: if you visit tempels, remove your shoes and head gear and wear clothing that expresses respect for the sacred nature of the site. You will need to wear pants and long shirts. Donations: it’s custom at monasteries to make a small donation to the monks as a sign of respect. Also donate to the Buddhist statues as a means of developing a generous and spacious mind. There are many places in each temple where you can donate, and it is expected that you donate to each place. Remember to have small notes for this gesture, although it’s not mandatory. Smoking is illegal at monasteries and in public places. Don’t bring cigarettes or chewing tobacco to sacred sites.